Well folks, it’s time to send a distress signal out into the world – things are getting tight now. After a week of cloudy drizzle and very little sunshine, my solar powered battery system is struggling. Yesterday I got a total of 15 amp hours worth of power into my system. Gah! Not much. Not enough, really. Especially not if the weather continues like this for much longer. For context: on a perfect summer’s day with maximum sun exposure I can get anywhere up to 80 amp hours a day. For more context: my Macbook charger uses approx. 3.65 amps per hour to charge my laptop. For someone who works from home, this is a little inconvenient. Charging my laptop for less than 5 hours would use all the power I’d gained during the day. My batteries still need to keep my fridge running and have enough juice for my water pump to kick in every now and then. The real stress comes from the fact that you aren’t supposed to discharge batteries below 50% of their capacity as it shortens their life and efficiency. Sadly, I don’t have a safety switch that turns the system off when the batteries hit that magic 50% mark (I did ask for one, but apparently they’re not at thing). I have to monitor my usage, what’s coming in and the voltage of the batteries to know what level they’re at. Annnd then I either cross my fingers a little harder for some sun (which I’d feel bad doing, given how much we’ve needed the rain) or I get creative. Last night, that creativity meant a head torch rather than lights. 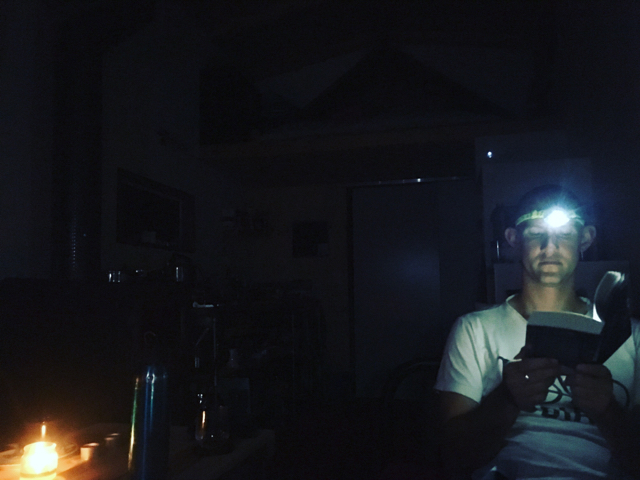 Today, it looked like working from a local café, sneaking down to the big house for a shower to avoid using my water pump, and a candlelit dinner to save on lights (romantic AND power saving!). If this continues, the creativity may look like an emergency extension lead from the shed into my house. The main problem with this plan is, it won’t help my batteries much. You see, my inverter isn’t designed to allow external charge of the batteries. Which means that with my current set up, I can unplug the whole solar system and run the house from a generator or an extension lead, but I can’t charge the batteries with one. The only thing that will recharge the batteries at this stage, is the sun. In the manual for my solar system, I was warned about ‘May Day’. This phenomenon occurs as the days start to get shorter and we continue living in the honeymoon shadow of summer – the May Day shortage can sneak up on you. While I moved into my house at the start of May last year, I didn’t have anything to power at that stage. And then I went on a road trip for seven weeks during winter (excellent move if you ask me). And maybe I also just had better luck with the weather! Either way, this is a new challenge I’m chalking up on the list. Now that we’re in July I had hoped the May Days were behind me, but I suppose it takes a little while to pass by the solstice and head out the other side. We’ve had discussions with my solar company and one of the less creative options and more long term solutions is to buy a third, mobile solar panel. This panel can be moved around to maximise solar collection throughout the day and can be packed away during the sunnier months, when the system has plenty of capacity. While this is a great idea, the main problem is that the house is tucked away in a corner, surrounded by trees on the north side of the house. At this time of year, the sun drops so low in the sky that there’s only an hour or two where the sun can shine directly on the panels, or really on the house at all. 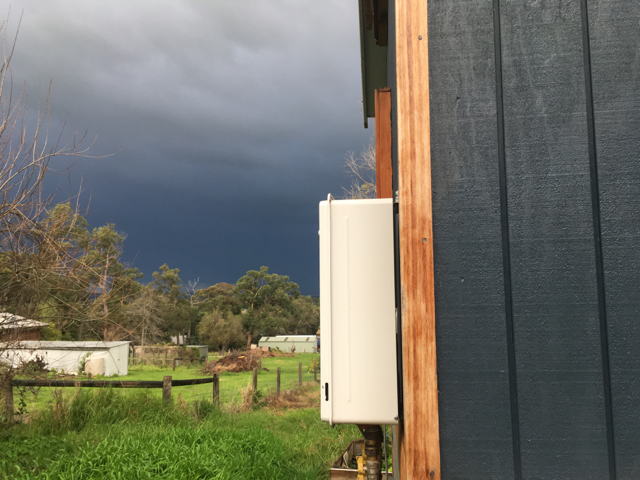 A mobile panel would need to be in fairly close proximity to the house in order to connect to the batteries, and would therefore have a fairly good chance of also being shaded. Also, it would involve rewiring the system to add a third, mobile panel. Boo. I’ve called Geoff the solar expert twice now looking for solutions. As any experienced solar guru would do (I imagine), he coaches me through to the point where I agree to go back to candles and see what next week’s weather will bring. It seems that being a real pro at this solar thing is mostly about staying in tune with what’s coming and adapting your usage ahead of time to compensate. The panic points come when the clouds come out, but truthfully the system is designed to function well all the rest of the year. If you can get through the May Day weeks and look after the batteries, the rest of the year you’ll float easily enough. Tomorrow’s hump day of this May Day week, wish me luck! Oh dear. I feel your pain. I live in a house off the grid. We have 4 children and for the first 4 years did not have a back up generator. 3 of us were working in hospitality and my husband expected us to go without showers for over a week. We had to visit friends or family to use their showers, which became quite a tiresome thing to do. He went away every winter while we had to battle the lack of power, until my eldest daughter and I both put our foot down and said we had to have a generator. 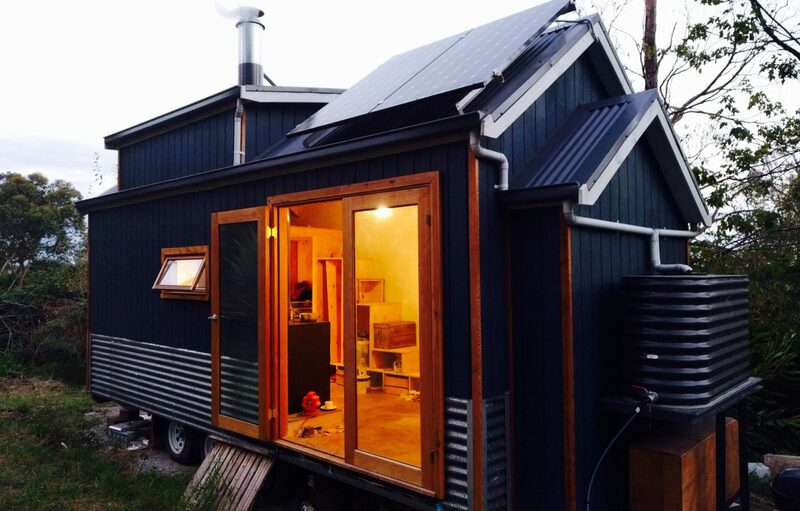 I understand that in your tiny house a back generator isn’t what your system is set up for, but I truly suggest a change in inverter so that you can have that sort of system. I don’t know how we ever survived without it. Wow, that sounds like quite an adventure Lyn! It’s good advice, and I think it’s certainly the part I would change if I could go back and do it all again. Having an inverter that charged the batteries would make those cloudy weeks a lot easier and I would worry a lot less about the battery life too. I started with second hand batteries as well so I have no idea how long they’ll last, but if I ever have to replace them I’ll be replacing the inverter too. 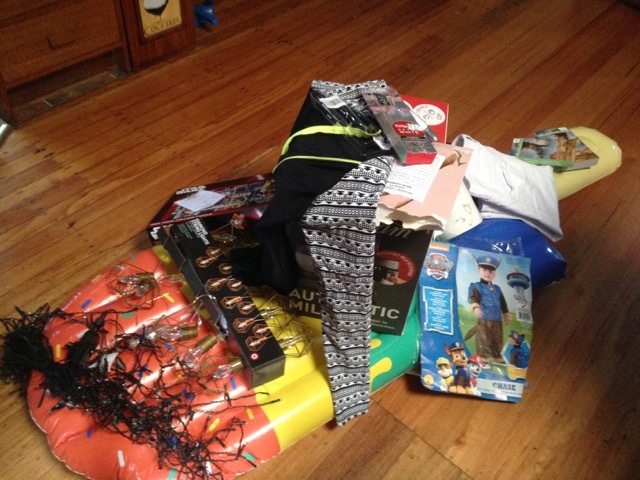 Kudos to you and your amazing off grid efforts though, very impressive!